Today is the Mid-Autumn Festival. Wey said to me, "Didn't we just celebrate Mooncake Day?" 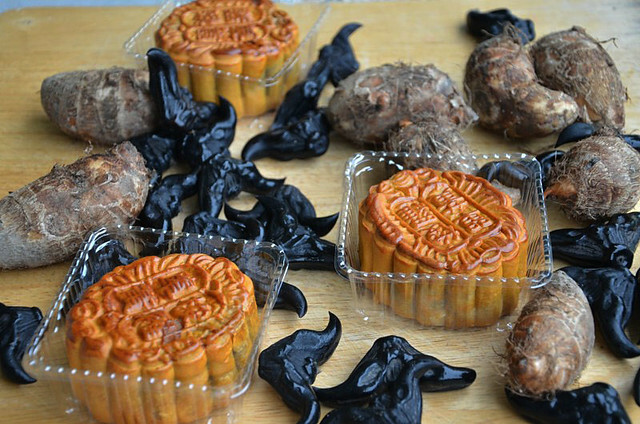 Mooncake Day is to Malaysians and Singaporeans what Mid-Autumn Festival is to the rest of the Chinese in the world. Chinese families (and Koreans and Japanese, I think) will have a big family dinner and in cities such as Taiwan and Hong Kong especially, families will sit al fresco after dinner to sip tea, eat mooncake and gaze at the moon which is at the brightest this night once a year. In ancient times, people will also compete to recite poems that celebrate the moon. I have written a post about the Mid-Autumn Fest which was linked picked up by Epicurious, and another post here. My memories of the Mid-Autumn Festival are lots of food, mooncakes, mooncakes shaped in piglets and stuffed into plastic 'cages', pomelo (a huge fruit 5 to 6 times the size of a grapefruit), lanterns, family, fun, games and my mom's Mid-Autumn Fest party for kids in our neighborhood. When my kids were younger, I'd go with them around the taman carrying lighted lanterns just like how I did when I was a kid. Nobody does that anymore, which is a pity. We had a very happy Mid-Autumn Fest celebration tonight because my daughter came home from Milan today. She had a gruelling flight back because there was a long 12-hour transit in Kuala Lumpur airport, and then the flight coming back to KK was delayed. Since we had a big Chinese dinner at my MIL's last night (as we do every Saturday), and since Yi had brought back goodies such as parmasan reggiano, gorgonzola (smells like stinky feet! ), parma crudo, pancetta, truffle oil, truffle honey, truffle salt, salami, Italian chocolates and a Nespresso machine, I cooked western food instead, which made everyone felt like it was Christmas instead of Mid-Autumn Fest. After dinner, we sat out on the patio and ate mooncakes, carrot cake, baby taro, ling gok, excellent Nespresso coffee (our Tenom coffee tasted like stale diluted coffee compared to Nespresso) and Chinese tea. With a slight breeze after a light rain, the air was cool and it was a lovely evening with my mom, my parents-in-laws, my younger BIL, Hub's cousin Ben and wife Janet, and my oldest and youngest kids. Only three things were missing. Lanterns ( I forgot to buy/make), the moon (hidden behind heavy clouds) and my middle child Ming (studying in Melbourne). Janet brought a delicious dish of steamed fish and ham slices in a butter and milk sauce. I will make that dish one day and post the recipe. Yi made two salads. 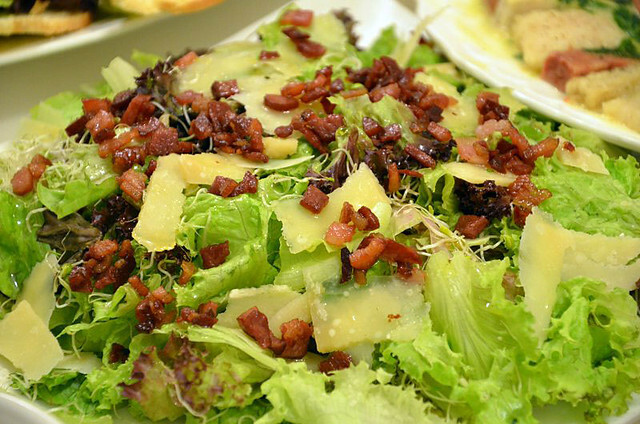 This lovely salad was mixed greens with fried pancetta and freshly shaved parmesan. 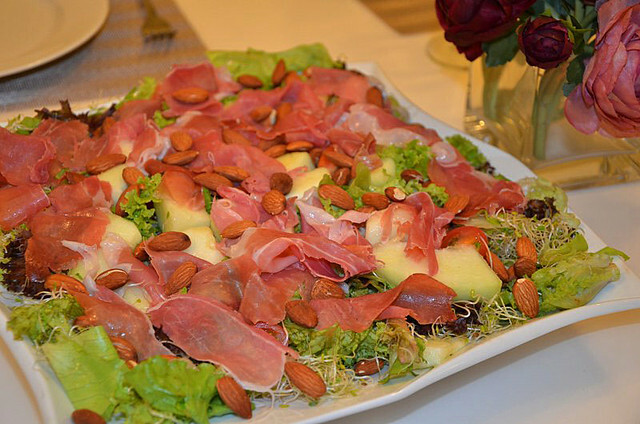 Parma ham, honey dew, mixed greens and toasted almonds (crispy thin slices of baguette added later)--yum! 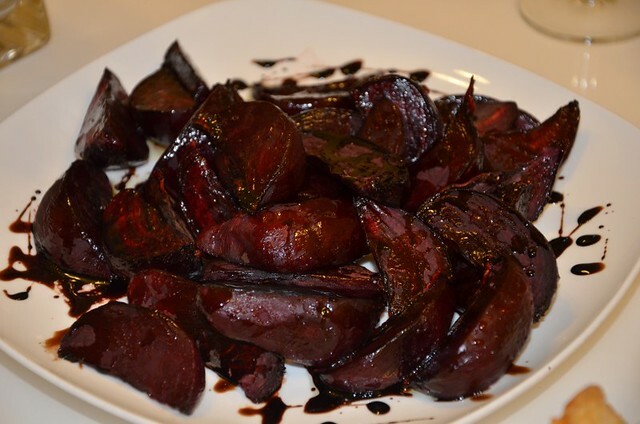 Caramelised beets with balsamic glaze. 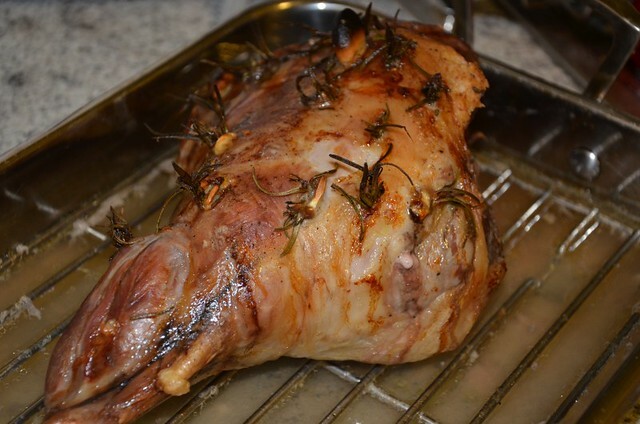 Roasted leg of NZ lamb--very tender and succulent. Wey made yummy mashed potatoes with truffle oil to go with the lamb. 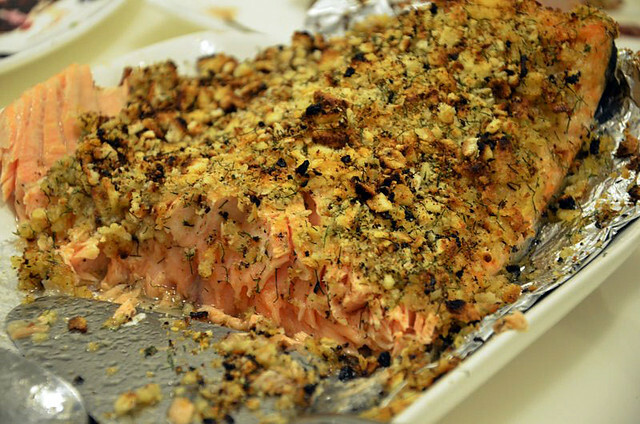 Fillet of salmon with a crust made of bread crumbs, potato chips from the bag (yes), fresh dill from our garden and Dijon mustard was surprisingly good. The recipe was from an old copy of Cook's Illustrated. Autumn is when baby taros are abundant. The black moustache-like things are nuts called ling gok, which are only available this time of the year. Ling gok are from China, and they grow in ponds. When opened with a nut cracker, the white meat inside is floury and slightly sweet with no distinct flavor. The ling gok reminds me of my father, who always boiled them to eat when they come into season in Autumn. If he can't finish the nuts, he'd dig out the meat and make hanging decorations with them. I still have Dad's car charm made of ling gok. It must be over 17 years old. Mooncakes tins used to have paintings of pretty Chinese girls in cheong sam. I wish I kept some of the tins; they were so pretty. 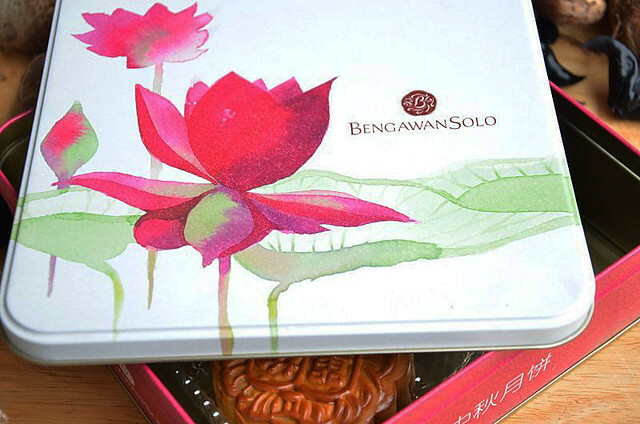 After the mooncakes are eaten, the tins are recycled into sewing boxes or small gadget containers. This box of mooncake is from Singapore, given by our friend L. It is so pretty. I am keeping it. 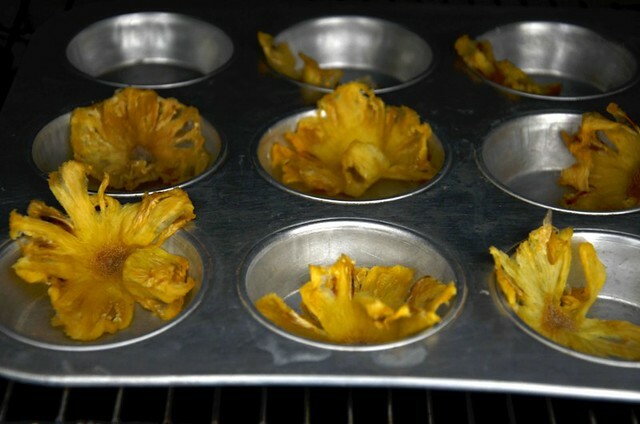 Flowers made with pineapple. These were overdried and nearly crispy. Martha Stewart was probably one of the first to blog about making pineapple flowers because her post on it dates back to 2003. The first time I made pineapple flowers, a few months ago, it was a nightmare. According to the recipe, the flowers take about an hour to dry. I followed the instructions exactly but my flowers didn't dry after one hour, then another hour and another hour and it became an obsession everyday to dry the flowers in the oven after I had baked something, to take advantage of the remaining heat in the oven after it was switched off. After a week I felt like the dumbest person ever. The flowers turned darker and smaller but they not only were not dry, they became sticky and wet and limp. I tried drying the ugly sticky flowers under the sun instead. The flowers just remained sticky. And ugly. I had used a Sarawak pineapple and a local variety pineapple, just to see which one made better flowers. The Sarawak pineapple is always sweet with hardly any sourness, gives a slight crunch and has less juice than other pineapple varieties. I thought that the Sarawak pineapple would dry faster but it too became sticky and remained so after a week of drying. It bothered me that other bloggers could make pineapple flowers and I failed. Everyone who made them said it was simple so that didn't make me feel so good. One day it occurred to me that the stickiness in my flowers was due to the high amount of sugar so I should start with pineapples that have very little sugar or juice in them. And so it turned out that that was it--the greener the pineapples, the faster and better the flowers dry. The key to making pineapple flowers turned out to be just that: the greener the pineapples, the faster and better the flowers dry. 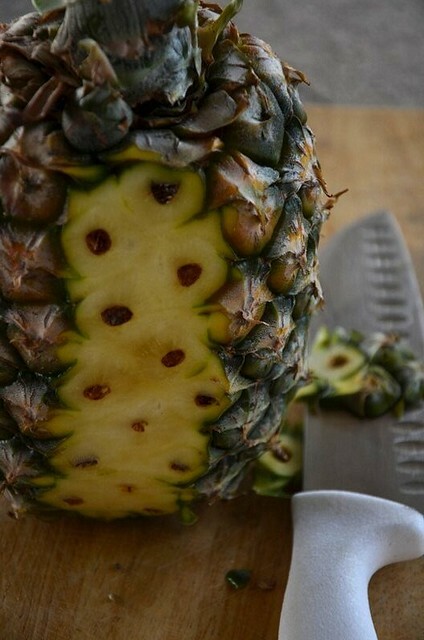 Start by cutting the skin of the pineapple off, then cut out the 'eyes' using the knife or a melon baller. Now slice crosswise very thinly and lay the pineapple slices on a baking tray lined with baking paper. 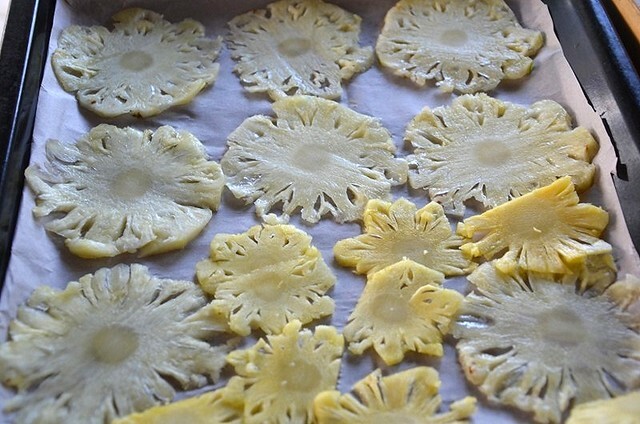 Put the pineapple slices into an oven heated at 110 to 115 C. After 15 minutes, mop the surface of the pineapple slices with paper towels, then turn them over and mop again and continue drying. Repeat the mopping every 15 minutes. After about an hour, when the flowers are not wet to the touch and can still be bent, take the tray out and remove the flowers. The flowers should feel dry but are still flexible. 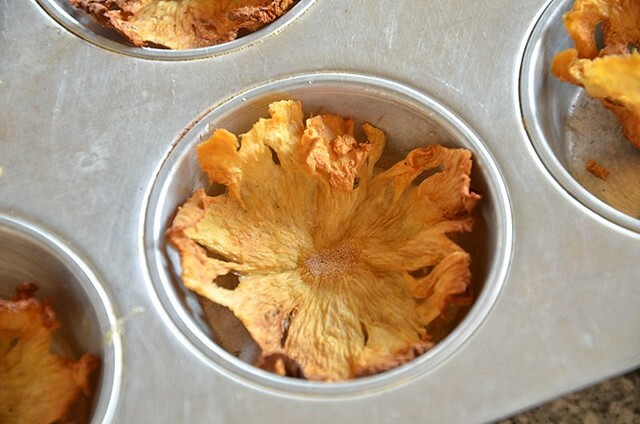 Transfer them into small cupcake pans and bake for another 15 to 20 minutes or more at 110 C so that they dry into curved, realistic-looking flowers. The total drying time from beginning to end is longer than an hour, especially in humid tropical weather. Keep dried flowers in airtight containers, especially in humid weather. Use the pineapple flowers to decorate your cakes! Only a few short years ago, I didn't know why strawberry shortcakes here were not the crumbly, scone-like real shortcake shortcake. 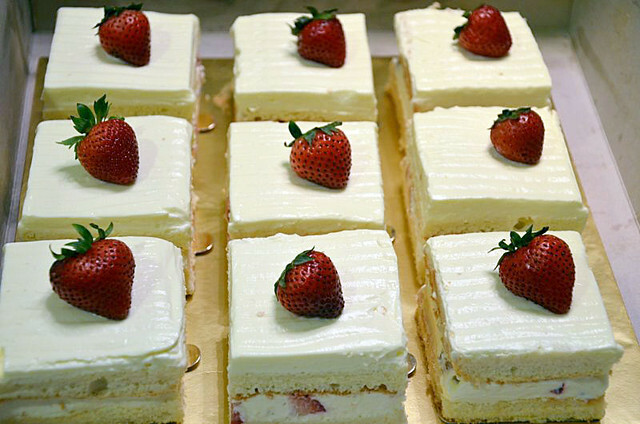 Turned out that the Japanese, lover of all things cute and girlish, came up with a strawberry and cream sponge cake (usually flavored with kirsch or other liqueurs) that is completely different from the American shortcake (poor Americans, now their shortcake is not the only shortcake around). I love both types. American shortcake is the first dessert I ate in America as a student visiting from Canada when my aunt Lucia made dinner. I thought it was the best thing I had eaten in years (sorry, Canadians, all I could afford was cakes from Safeway so anything else made a huge impression). 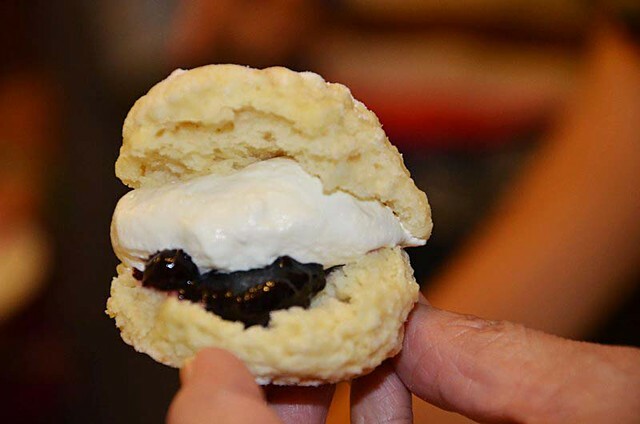 And really, the two different shortcakes show the contrast in taste between westerners and easterners when it comes to cakes, although more and more of my friends are demanding more than just 'airy moussy nothingness'--my term for most cakes sold here. 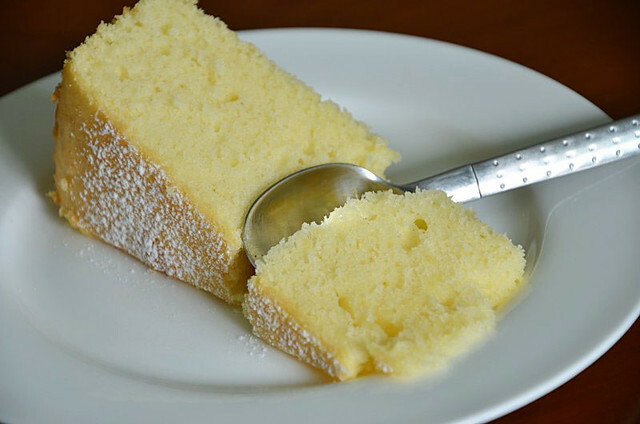 Westerners prefer cakes that are sweeter, more substantial in texture and with more depth in flavor while easterners perfer super light, less sweet, very soft and delicately-flavored cakes. I like both. That makes me a Wasterner. 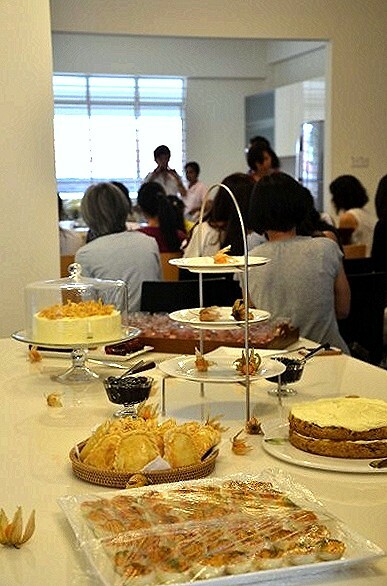 One more seat left for tomorrow's baking class. 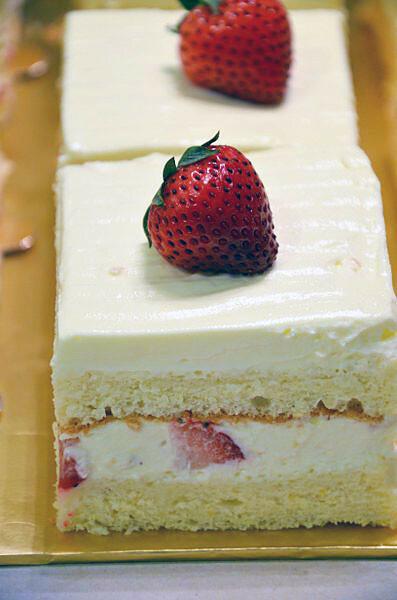 Japanese strawberry cream cake will be one of the cakes you'll be learning. 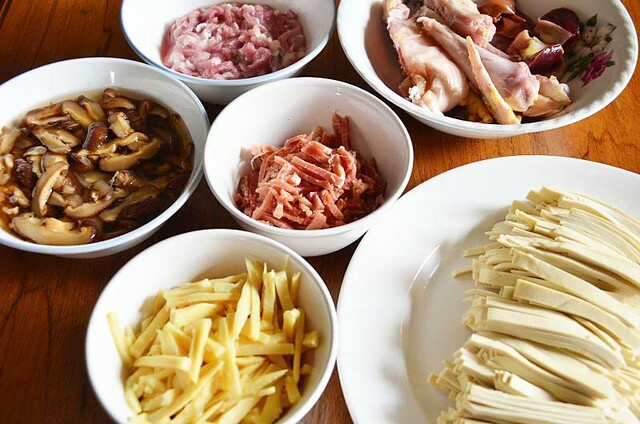 Gunxi tang is bean curd strips soup, and it's always on the menu in authentic Shanghainese restaurants and the ingredients are usually cut finer than we do at home. We can't get thick bean curd sheets here and there's no substitute but just in case you get your hands on some of the real stuff, do make this soup. My Hub was in Shanghai two weeks ago and all he brought back was different kinds of bean curd sheets. I've frozen them in little packs so they should last until somebody else brings more over. My Hub averages 4 to 5 bowls each time his mom or I cook it! Ok, more when his mom cooks it but it's okay, I'm cool about that. 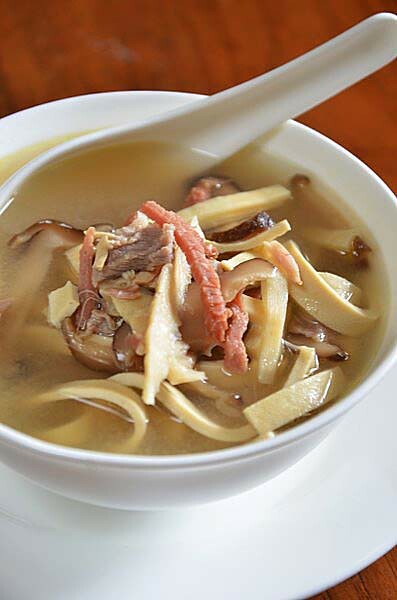 I admit to 2 bowls myself although given the choice, I prefer yindooxin, another famous Shanghainese soup made with nearly the same ingredients except for the soup base and the cured meat, salted pork and pork bones for yindooxin and chicken soup and Chinese ham for gunxi tang. It's late and I still go to bed past midnight even though I made a resolution to go to bed early and wake up early once I get started on my new venture. Old habits don't die hard, they just don't die! Cut the ingredients finer than this for a better-looking soup. 1. 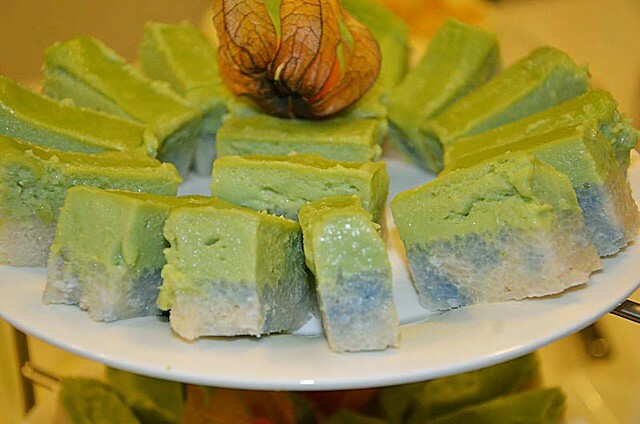 Wash the bean curd sheets and cut into fine strips. The finer the strips, the more refined the soup. Restaurants arrange the ingredients neatly in a claypot and steam the soup. Cut pork, mushrooms, bamboo and ham into fine strips too. 2. Put the chicken stock (if using whole chicken, boil for an hour, remove the chicken & use the stock) to boil in a large enough pot. Add the bamboo and mushrooms and boil at medium heat for 30 minutes. 3. Add the bean curd strips and boil gently for 15 minutes, then add the pork (stir well with chopsticks to separate) and boil 10 minutes. Add the ham, stir well and let it come to a boil for a minute. Taste and season with salt if needed. Serve hot, with black vinegar if like. I've been experimenting with several recipes and have found my ultimate whipped cream recipe. 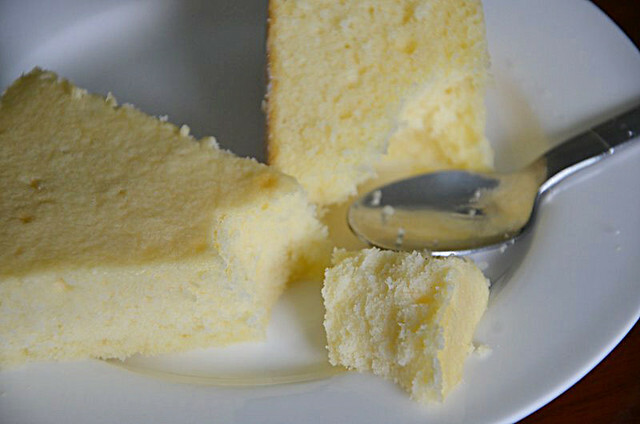 The cake is extremely fine and closed-textured but utterly tender and truly melts in the mouth. I think it will be the perfect cake for me to create new cakes with. So happy. This whipped cream cake is Rose's version. It is light, soft and delicious. I couldn't believe it, but this whipped cream cake is even better than Rose's, agreed unanimously by 9 different tasters. Paler than Rose's but extremely fine-textured and downy, and very yummy too! Another 2 tasters said they found both versions as good. This is one of the best 'butter' cakes I've ever tasted. No recipe here but you can learn it in my classes! 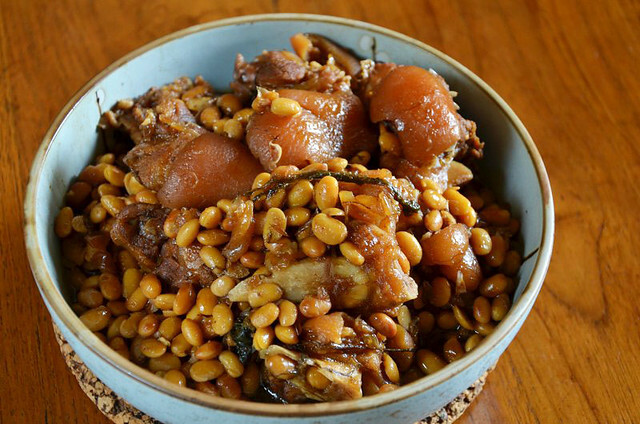 Pork leg with soy beans stew--so so yummy. 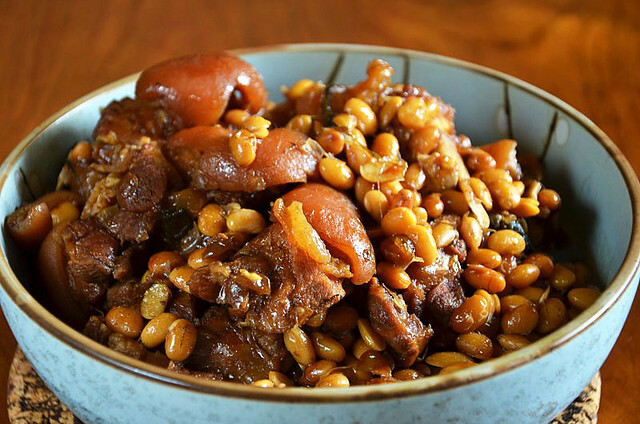 My MIL's Shanghainese pork leg and soy beans stew is a dish we look forward to find on her dining table when we eat dinner at her house on Saturdays but after tonight, MIL's pork leg stew looks like it has stiff competition from the stew cooked by my son Wey. To add insult to injury, it was the first time Wey had ever cooked the dish, and first time he ever handled a pork leg, which disgusted him a bit. This is a great dish for one-pot dinners when you are too lazy to cook a banquet. Just add a soup and stir-fried veggies and nobody should complain. I don't cook pork leg often but once in a six-month while I do, especially when I see my face getting drawn and thin. Pork leg has lots of collagen and gelatine so go easy on that expensive jar of SK II and eat pork leg instead. Wishful but you never know. This recipe is adapted from an old Japanese cookbook and all the ingredients are the same as my MIL's except sake is used in place of Shaoxin wine and Wey added a bunch of scallions and a tablespoon of dark soy sauce. If the skin and ligament are not stewed soft enough, the gravy or sauce will not have that slight stickiness which is desirable (the stickiness) and makes the dish tastier. If the skin and ligament are cooked too soft, there won't be a bite although my son Wey prefers them that way. The best texture is when there's still a slight bite in the skin and the ligaments come off without you having turn your face to one side and to use your fingers to pull them off. What I do is cook the pork to a stage where the skin is still a little bit springy, turn off the heat and let the sauce and flavor seep into the meat and then after an hour or so, timed about half hour before dinner is served, re-heat the stew. 1. Have the butcher clean, shave and cut the pork leg into large fist-sized pieces. Put the pork leg into a bowl and scald with enough boiling water to cover. Stir, then drain the water away. This step will clean the leg of any dirt or hairs and also gives a clearer gravy instead of a cloudy gravy later. 2. Marinade the pork leg with 3 tablespoons of the light soy sauce and the sake for about 1/2 hour. 3. Heat a heavy-based pot (such as AMC's) until smoking, add the oil, the ginger and spring onions. Fry until the onions are wilted. Add the pork leg (keep the marinade liquid) and stir fry until the skin is tightened and seared. 4. Add the soy beans to the pork leg, stir to mix well. Add the remaining 3 tablespoons of light soy sauce, the 1 tablespoon dark soy sauce, the marinade liquid and enough water to just cover the pork leg and soy beans. When the stew boils, turn the heat down to low and simmer, covered, for 1 1/2 to 2 hours, depending on how you like the texture of the skin and ligament. There's no need to add anymore water but if you are cooking longer than 1 1/2 hours, you may have to add 1/2 cup of water. However, if there's too much liquid. turn the heat to medium high and take the lid off to reduce the liquid. The gravy/sauce should be runny and just a little bit thicker than water. Taste and season with more soy sauce if necessary. Serve hot with rice. This dish gets better the next day. What a day it was yesterday! Murphy sent the wrong dining table the day before the event, messed up the socket where my new KitchenAid mixer was plugged, not letting any current through (thank God I checked the day before and the electrician came after work hours), messed up the fridge too because it got warmer and warmer...basically everything went wrong. Even my carrot cake, which I've made hundreds of times but this time made a mistake of measuring by weight rather than volume. Oil is lighter than water and the resulting cake was so soggy it broke apart when turned out. 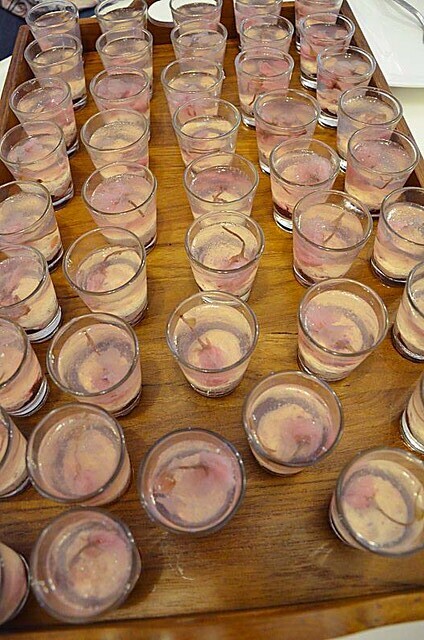 I threw it out and started on another one early in the morning, after a sleepness night when I realised that the reason why my jellies gelled so quickly--and messed up the cherry mousse--was that I had mistaken agar powder for gelatine. Begone, Murphy! But nobody seemed to notice the flaws and I am so happy and thankful for the 40 specially invited readers and friends who came for the opening. 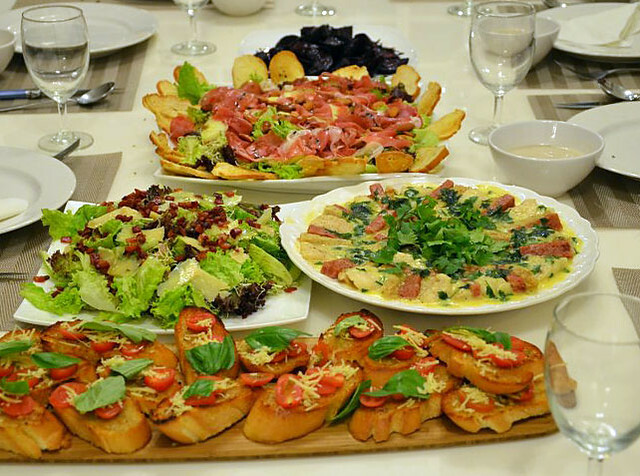 I am especially happy to meet some of you who have written to me through the years, either by email or to this blog, and by so many of you who came to tell me about the success you had using recipes from this blog. Do leave comments because I want a relationship with readers. I don't want this to be a monologue blog; it's lonely. Anyway, here are some of the photos Eric (5 guys confirmed their attendance and 3 backed out last minute) took of the party. I am not putting our group photos here (although you can find them on Facebook--hungerhunger) because I don't have all your permission but there's a photo where everybody turned away so yeah, that should be okay to post. I'm going to call my classes 'Terrific Cooks'. Those who come will all be terrific cooks:) Btw, I sincerely apologize for not replying some of you, and even omitting some friends from the list--inadvertently--because I was so busy getting the new place ready. My hub is in Shanghai and it would have been tons easier with him around but I decided that I must start because it's already September, and the holidays are dawning. Another thing. Sorry we totally forgot about milk and sugar for the coffee and tea. I didn't even leave coffee cups out because the store where I ordered the cups weeks ago did not tell me that they couldn't source the cups anymore. It's great to live on Borneo Island, but I can't even get 50 good tea cups. 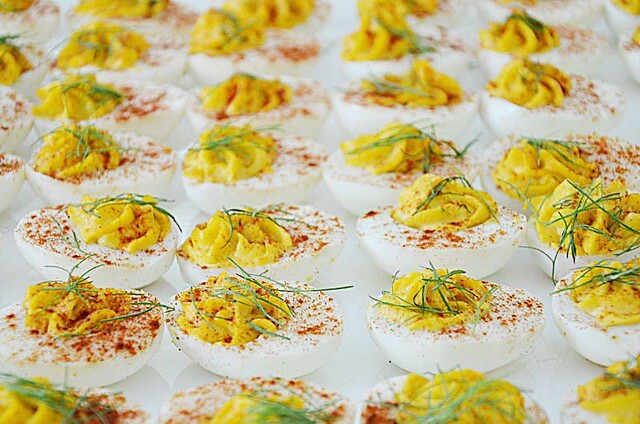 Devilled eggs made by my son Wey. Everybody liked it. I think the yolks could be piped fuller. This was a surprise hit. I just thought I'd make crostinis using the same ingredients that I'd use for pizzas. 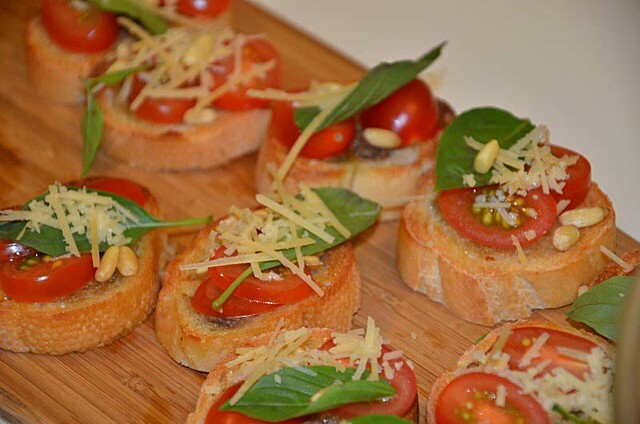 There were toasted baguette slices, assembled by Eric, Francis and whoever wanted to help, spread with anchovies-infused oil ( a great tip from my reader-friend, David, who's a chef in Bangkok), sliced cherry roma tomatoes, toasted pine nuts, Thai basil and shaved parmesan. After the crostinis were gone, I realised that I completely left out the balsamic glaze which would have made the crostinis beyond excellent! 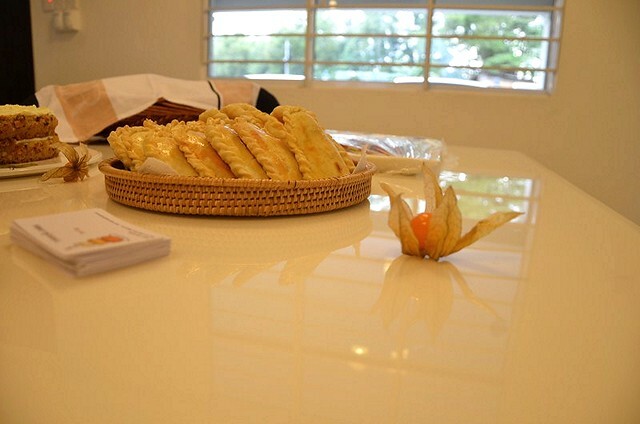 The serimuka was made about 4 hours before the class, which meant they had hardly cooled down, let alone set firm. I also had to hand-blend the custard because they turned lumpy when cooked too quickly, and the blending made the custard foamy. 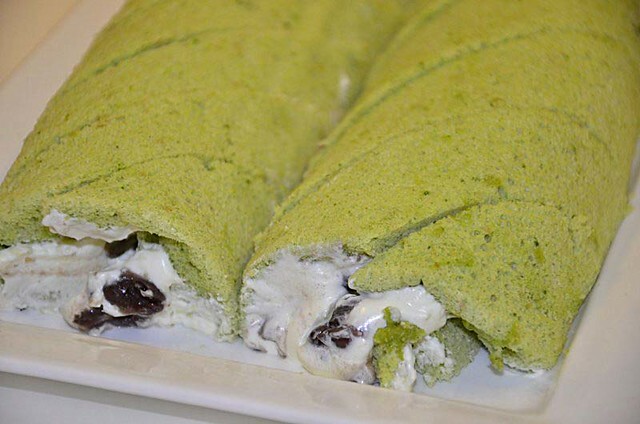 Green tea swiss roll with white chocolate (Valhorna) ganache filling. This was my demo cake. Sakura jellies. Not everybody liked this because of the saltish taste and dried plum flavor but I thought it would be interesting to serve as dried sakura is rare and not many people have tasted it. 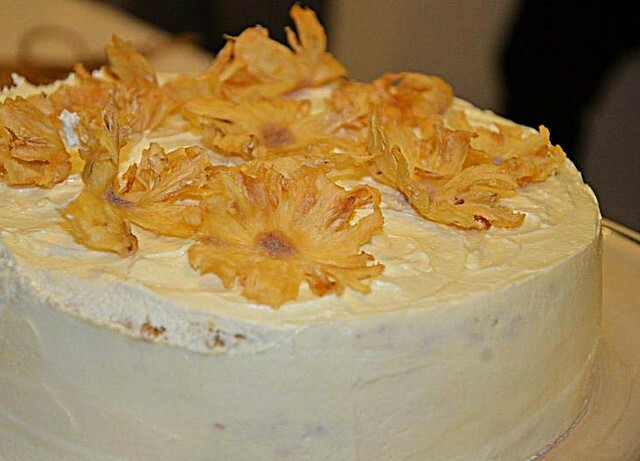 Carrot cake with flowers (chrysanthemums, someone said) made from pineapple. 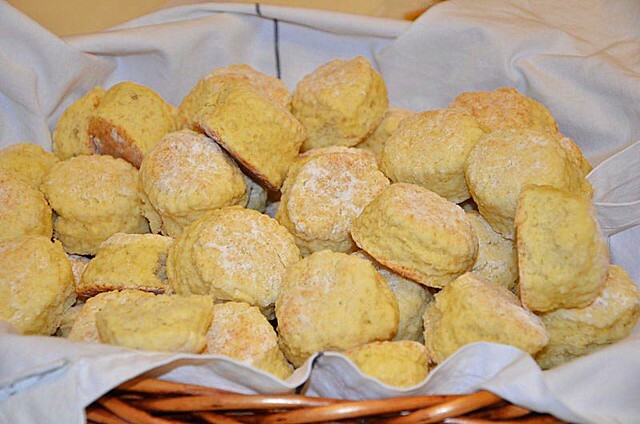 My friend Elaine makes the best scones so I had her make lots of mini scones. They were great I heard--gone so fast. I want my classes to be enjoyable and interactive. I will gladly teach and share my cooking experience (aka mistakes). 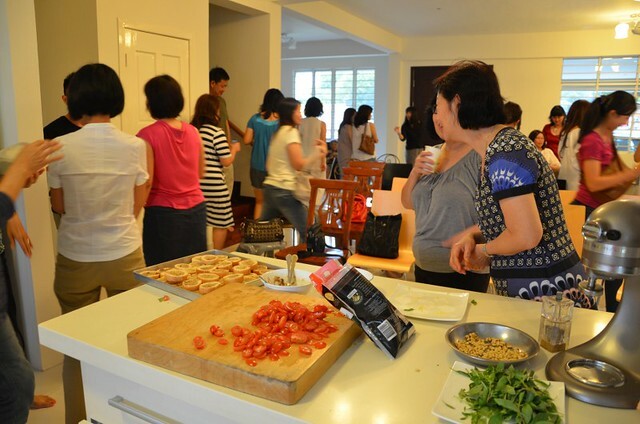 The home setting (although I don't live there) is more comfortable and personal than a shoplot and I hope will be a place where you relax, have fun, meet new and old friends and eat great food. Excellent assam laksa, before they shrank the size. RM7.90/8.90. 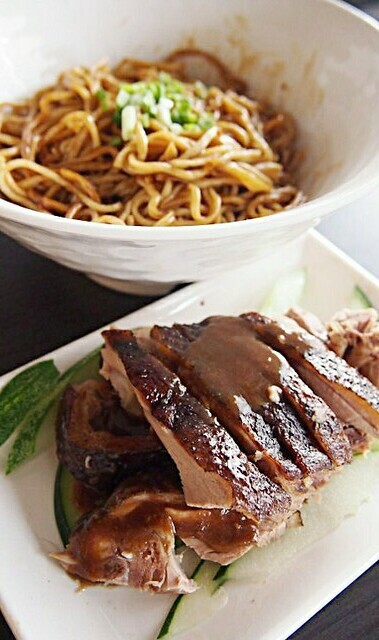 J's noodles are said to be made from ducks' eggs, the best eggs for making noodles. I've wanted to blog about J's Cafe for the longest time but never did it because I lost the photos and then when I took a second batch of photos, I was too upset with the cafe to bother writing a review on it. 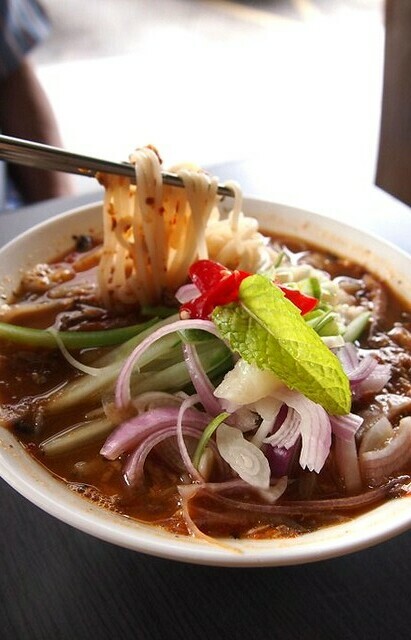 J's Cafe is probably about a year old and their best seller is their Penang assam laksa. As you know, I LOVE assam laksa but I've never really eaten a really good assam laksa in KK or KL that's as good as those in Penang, with the exception of home-cooked assam laksa made by Penangnites. I do have a good assam laksa recipe but I can't get the slight syrupy thick soup that they do in Penang. Cooking assam laksa is a big deal for me so I've only cooked it about once every 4 or 5 years! I think because I always make tons of assam laksa each time, I am stumbled by the thought of preparing all the ingredients. You can imagine how happy I was when I ate my first mouthful of J's assam laksa early this year. J's assam laksa is not exactly like the regular versions of assam laksa in Penang. It is more refined but yet it tastes/tasted awesome. Yes, the toppings are spare, there's no bunga kantan and the pineapple strips are cut so long it's hard to shove them into my mouth, but generally the soup is awesome. It just made my days whenever I ate a bowl of J's assam laksa, which was about once every week during May and June, and I've brought more friends there than I have to any other cafes or restaurants. Everyone I've brought to J's Cafe agrees with me that it's very good laksa. However, since June this year, I've noticed the change in the laksa. The noodles have dwindled to half their usual portion. You may get that piece of kembong fish fillet, or you may not. You may get the prawn paste sauce, or you may not. The soup can sometimes be too sour. In the last few weeks before I stopped going to J's Cafe, I complained to the owners each time (about 5 times by now) about the small portion of noodles but the reaction went from "Okay, next time we'll make it a bigger portion." (how about this time and of course the next time they didn't, except for one time when I was absolutely upset) to "Some customers don't finish their noodles so we have reduced the amount rather than waste the noodles." Right. Half the amount of noodles at the same price. Clever. I've stopped going there after my last bowl of assam laksa came full of cucumber strips. Little noodles + lots of cucumber strips = strange mouthfeel. On top of that, J's cafe now gives a choice of fresh or reconstituted dried noodles. Take it from me, the extra ringgit is not worth paying because the 'fresh' noodles are very chewy. But customers really don't have much choice because the waiter will tell you that the dried noodles will break and are rougher. (It's like a steakhouse waiter telling you "Take the ribeye because our sirloin tastes like leather.") Should anyone from J's Cafe be reading this, here is a photo of the best dried assam laksa noodles in the country. The noodles are from Servay (or Giant?) and they taste really smooth, fine and have a chewy bite that's just right. No nasty artificial machine-made flavor. In fact, if you don't know, you'd think these are fresh noodles. 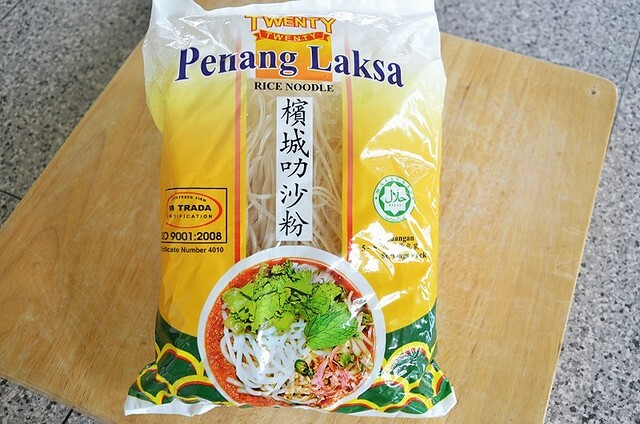 Unlike other laksa noodles, Twenty's noodles do not break or disintegrate even after they're cooked and chilled and recooked, due to the combination of rice, sago and tapioca flours. Just don't soak them in hot water. They are more work than fresh, because they need to be soaked in room temp water and then blanched in hot water before using but trust me, these are very good noodles. They can be cooked like regular noodles, not just for assam laksa.